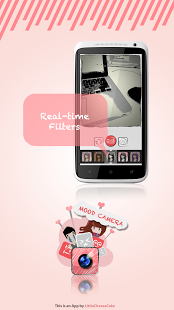 Mood Camera is a stylish camera with fantastic real-time filters. 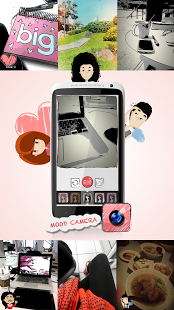 Through the lens of Mood Camera you see the hidden beauty of the world around you. You can also put a sticker on the view to express how you feel at the time. Then take the photo and share with others! Time – good old time is memorable. 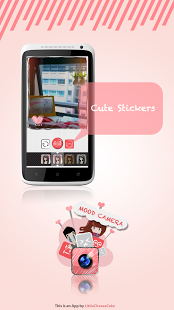 Mood Camera got the cutest stickers to express your feelings. Stick it at the corner of the photo and share your mood with your loved ones. The little fat girl named Daisy, who has a huge crush on the cute boy. Will she get the heart of the boy, we will see. In-apps sharing. Save locally for later view, or email to someone instantly. Or upload to facebook album directly, or send as a weibo message. She is fascinated by technology and art, and hopes to bring the art to everyday life with her limited professional knowledge. The idea of the app is to mix the art into the daily life. Most of us don't have the gift as Van Gogh, Monet or Picasso, and cannot create art masterpiece. But technology provides us the power to view the artistic style of the scene through a simple mobile phone camera. The world is the canvas, and we are the artist. The hand-drawn style UI is all drawn by the designer. In her blog, she also shared the algorithms and source codes of the some of the filters, and some more art work and the full story of the little fat girl with the boy.